Allium Cepa is a wonderful homeopathic remedy made from red onion belongs to the vegetable kingdom is the most common herb and spice used in daily cooking foods and salad all over the world. Homeopathy potency made from red mature bulbs of red onion, it was first proven by Dr. Hering in 1847. Onions are rich in multivitamins and various essential minerals; this herb is used for various common diseases like common allergies, colds, fungus, earache, flu, etc from centuries. Maybe the fast food onion fryers for some reason do not engage with the consciousness of the onion, so lacking that spiritual essence could be the reason why fast food onion fryers do not receive the healing benefits of onion medicine. Politically and economically there is a definite drive to push homeopathy to the wayside. Time for united action, strategic marketing, a political voice that makes itself heard. Personally, I did not want to put the 4H posters of celebs on my clinic wall or advertising as the truth seeker in me feels there must be a more powerful way of raising awareness. No offense to anyone involved as the effort is appreciated. I understand that celebs might catch the eye of some of the sleeping masses, but feel it somehow belittled the profession of homeopathy. Inspiring, truth seeking, tell it how it is marketing is needed. Homeopathically, it is time to fight fire with fire. Various researchers show that onions in socks in bed is good if you have a cold and wearing an onion around the neck allow for more absorption of its allegedly anti-cancer properties than direct absorption via the digestive system. Let’s have a look at Allium Cepa remedy under homeopathy. Temperament: This is the best-suited remedy for tired and psoric hot patients who easily infected by catarrhal inflammation of mucous membranes. Mind: Unhappy, angry, insecure, anxiety, foolish behavior, spoiled beliefs, making mistakes in writing and reading as well. Also watching Dreams of falling down, wars, and scary faces, insanity! A catarrhal headache in forehead and neuralgic pains like electric shocks in a face, skull, and chest. Burning and stinging sensation in eyes with a smoky vision, watery eyes with itching and sensitivity from light. Acrid coryza with burning sensation, nasal polypus and acute inflammation of nasogastric tube. A painful cough starting from larynx with tickling sensation, heavy pressure in the middle of the chest with difficult breathing, hoarseness bronchitis in aged people. 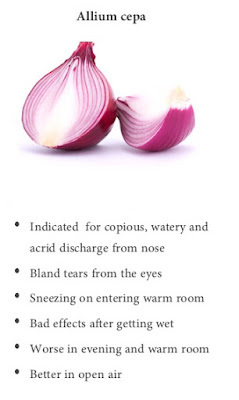 The desire of eating raw onions with offensive flatus of abdomen. Hay fever with other nostril allergies and bronchitis. Allium Cepa potencies: 6x and 30 for flu and acute cases, 200 and higher for allergies and chronic conditions. Relationship: In acute flu, hay fever and cold compare it with Gelsemium, Euphorbia, and Aconite. In chronic cases, Phosphorus, Pulsatilla, and Thuja work as a complementary remedy. The big pharma has the weight of corporate vested interests and the mainstream media behind them. It's a machine that is bigger than all the complementary therapy organizations put together. Exposing them, doesn't work, as unfortunately no-one is listening. My patients couldn't care less what's going on. They know homeopathy works how it works doesn't interest them. So they are not listening to the machine. Our profession is always arguing about the right or wrong methodology etc, this hampers any progress. Our primary goal is to not to be right but to make the world a better place. The fact is like most alternative doctors, homeopaths work hard at their practices and they need and deserve the support and professional collectivity that other branches of health care give to their practitioners. But while many practitioners see the dangers advancing all around them, they pay precious little attention to the pathways and history of these dangers. I hate to say this, but to be properly holistic and to be dedicated to homeopathy, means grasping its history and understanding its social implication today - understanding it's politics. Inevitably this means thorough deep investigations into its history and its organized and individual opposition. It is really not good enough just to smile and speak knowingly about the opposition they have to be fought and defeated. It's up to homeopaths to save homeopathy, in fact, I would go as far as saying that righting historical perceptions exploring the truth about the Ernst's of the dark-side, is one of the first tasks of the homeopath - it really is no good pretending that their practice of homeopathy is more important than it's defense. In today’s world all honest people have to defend themselves against the thieves and liars of corporate industry - there are no good fairies and there are few second chances. Best Wishes from a supporter of homeopathy and homeopaths.